Most jockeys race for fame and glory or for the monetary rewards that come from winning races. Certain jockeys of the 1930s, however, actually raced for peanuts! These jockeys weren’t just monkeying around; they were real monkeys and their steeds were racing Greyhounds. Try to visualize one of these monkey races.The jockeys resplendent in their colorful racing silks eagerly sit their mounts awaiting the start of the race. One rider leans over in his saddle and nervously begins to groom his steed’s neck. Two others screech at each other in an obviously heated exchange. The handlers quickly put some distance between the potential combatants as they reach out attempting to tear the silks off each other. Suddenly all the riders become quiet, listening intently. The sound of the oncoming lure gets louder. A bell rings. They’re off! Tails whipping back and forth and screeching loudly, the highly competitive tiny riders urge their mounts on to the finish line. Following the race, the winner is led by his handler to the winner’s circle and presented with a trophy dish of peanuts. The monkey jockey gives a toothy grin for the camera then greedily digs in for a well-earned feast. It may sound like fiction to us and, obviously, it would never happen in this day and age, but back in the 1930s a few Greyhounds really did have monkey jockeys. I first became aware of this fact on a visit to Lincoln Greyhound Park in Rhode Island. The track had a number of framed photos on display showing these monkey races. Later, on a visit to the Greyhound Hall of Fame in Abilene, Kansas, I saw actual film footage of these races and they were pretty much as I described above. If one were to consider the number of tracks hosting monkey races during the 1930s, these races would appear to have been a widespread phenomenon. In reality, however, they were the brainchild of a single couple — Loretta and Charles David. Once their venture was launched, the Davids spent most of the year on the road with about a dozen monkeys and Greyhounds traveling from track to track with their carnival-type act. After the monkey races proved successful, Loretta David confessed that, had they known just how much work, time and training would be involved in bringing this venture to fruition, they might never have done it. The secret to the Davids’ success was raising the monkeys and Greyhounds together so the animals would overcome their natural animosity, accept each other, and become buddies. The monkeys were imported as babies from Panama. Each represented an investment of about $2,000 at 1930s prices. It then took approximately two years (while the animals matured) and many hours of work by the Davids before they were ready to bring their act to the Greyhound tracks. Once introduced, however, the monkey races were an instant hit and each track wanted to host them. The Davids and their unusual entourage traveled together from track to track with the monkeys riding in little cages in the back of their car and the Greyhounds in a more conventional hauling trailer. Since monkeys are tropical animals and subject to pneumonia in cold temperatures, the Davids had to adjust their traveling schedule to the country’s weather conditions. In the summer they were hosted by northern tracks but, once winter came, they traveled between those in the southern states. The Davids also had to have a constant supply of peanuts and bananas available for their star performers. Wherever they went, the Davids’ monkey races drew crowds. Luckily for the Davids, not only did their idea prove popular, but both the monkeys and the Greyhounds, as is obvious from actual videos, loved to compete and showed a real desire to win. In fact, the monkeys proved so competitive they would sometimes get carried away and try to prevent a rival from winning by either jumping onto his back or tearing the clothes off him as he passed. They also used their tails as whips to try to make the Greyhounds run faster. Worldwide, the Davids were not the only ones to train monkeys and Greyhounds for racing, although they were the only ones in the United States to do so. At various times, monkey races are known to have existed in both Australia and Mexico. Today, the very idea of mounting monkeys on Greyhounds would be viewed with dismay or, at the very least, considered politically incorrect and would never come to pass. In reading this article, it is necessary to remember that these events took place during the 1930s, a time very different from today. 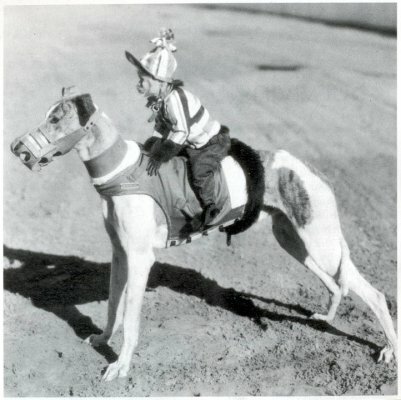 Some Greyhounds (once upon a time) actually did have jockeys. This is not only true but it is a part of Greyhound history.